I smiled back and asked if she liked it. “Oh, I loved it! It was great!” she said. In hindsight, I realize that by asking her, “Did you like it?” I was inadvertently asking the one question guaranteed to kill any meaningful discussion about a book. It’s the question most of us are inclined to ask our kids when they finish a book, but unless we know how to follow up, the question doesn’t get us anywhere. Of all the tools in our parenting toolbox, discussion ends up being one of the most important. Any time we’re building a relationship, in fact, discussion is the primary way we get to know and connect with one another. We’ve all heard about how important it is for families to eat dinner together. Dr. Anne Fishel, co-founder of The Family Dinner Project, states that dinnertime conversations are important in order to “relax, recharge, laugh, tell stories, and catch up on the day’s ups and downs, while developing a sense of who we are as a family.” Dinnertime conversation has even been linked to lower rates of substance abuse, teen depression, and higher grade point averages. When we engage in conversation with our child— when we ask him how his day went, what he’s worried about, or what the best part of his week was—we communicate that we are interested in his life and that we have time for him. When we have a conversation with our child about books, then, we communicate that we are interested in what he’s reading and thinking about. Without saying it outright, we tell him that it is a priority in our own lives to spend unhurried time with him. This doesn’t happen in the kind of conversation I had with my daughter about Princess Academy. Asking a child if she liked a book isn’t all that helpful. We need to ask questions that plumb deeper, and this takes time. Like all things that make a positive impact on our parenting, we have to prioritize meaningful conversations. We have to communicate love and interest in our kids, and we do this by carving out a bit of time and space to talk with them about life. The good news? Books make this easy to do, and these conversations can fit into our already busy lives. That would be ludicrous, right? When I finish a book or a movie that I find particularly moving, I have a strong desire to connect with someone else who has experienced the same book or movie. After reading Kathryn Stockett’s book The Help, I called up my friend and begged her to read it as soon as she could. I was eager to discuss my favorite and least favorite characters, talk through the historical context, and contemplate what the author was trying to say. I wanted to share that encounter. The experiences that have the deepest, most profound impact on us are meant to be shared. We are communicative creatures, and we naturally desire to exchange ideas when our thoughts and emotions are stirred. Shannon Hale, the author of Princess Academy, also wrote a book called The Goose Girl. The night one of my teen daughters finished it, she found me brushing my teeth in the bathroom, getting ready for bed. She burst in and slapped the book down on the counter. “Read this!” she commanded, a playful fire dancing in her eyes. You can bet she wanted to talk about it. A wonderful reading experience does that to us—it causes us to reach out to others. We don’t want to keep our most wonderful and transformative experiences to ourselves. When my daughter finished Princess Academy, I could have had a meaningful conversation with her, even if I didn’t know much about literary analysis, wasn’t well-versed in how to talk about books, and hadn’t even read the book. It comes down to having an easygoing, friendly approach and knowing the right questions to ask. You can do this without an English degree, CliffsNotes, or literary know-how. If you love your child and are willing to invest time in learning who she is and what she thinks, you can share meaningful and lasting conversation about any book under the sun. A conversation is, by definition, the “informal exchange of ideas.” The best stories lend themselves naturally to this. It’s what we do in our grown-up book clubs, after all, and what we do over news clips and movies. When we cut out our favorite Sunday funny and share it with someone we love, or when we get home from vacation and start telling stories about what happened after our car broke down on the side of the highway, we share the story and then start casually swapping thoughts and ideas about it. You already know how to do this—you do it every day without even thinking about it. Conversations about books don’t really need to be that different from any other conversations we have with our kids. It’s okay if you don’t know what an “exposition” or a “denouement” is when you’re talking about books. Silence the old middle school English teacher for now. What we’re going for is not the same thing you were shooting for in that English class, anyway. We want our homes to be more like a cozy book club environment and less like a formal classroom experience. The books that move, shape, and transform us are almost sacred. Isn’t a Venn diagram, a literary exposé, or a plot chart the last thing you want to do when you fall deeply in love with a book? The best stories naturally cause questions to bubble up within us. They spur more questions than answers and lend themselves to a casual, enjoyable, leisurely conversation. Those conversations can become one of our greatest joys as we build relationships with our kids—if we approach them with the right attitude and if we ask the right kinds of questions. Before you start worrying about how you’re going to cram these conversations into your already bursting-at-the-seams days, let me share two different approaches for talking about books. You can use either. I use both. A book club conversation is an intentional conversation. Everyone usually reads the book in advance, and the goal of the gathering is to discuss it—that is, to swap ideas with each other. Intentional conversations with our kids are similar. My kids and I don’t have them about every book we read aloud together. We have these intentional conversations only a couple of times a year. The only characteristic that distinguishes an intentional conversation is that I purposefully set aside time for it. I mark it on the calendar. It’s an event. I tend to carry out these conversations at restaurants or cafes, if only to seal them in my children’s memories as some of our most enjoyable family events. “Lunch tomorrow at Frank’s Diner while we discuss Jasper and the Riddle of Riley’s Mine!” I’ll announce, and everyone will cheer because pancakes—and because we enjoy the conversations we have about books. No one knows ahead of time exactly where the conversation will lead, which, it turns out, is half the fun. The questions you ask in an intentional conversation happen to be the same questions you ask in organic conversations. But we’ll get to what those questions are in chapter 11. First, let’s talk about the kind of discussions that are not planned ahead or scheduled. Organic conversations crop up out of nowhere. They start and end with one question, or mosey on into a lengthy discussion as we drive in the car, wash the dinner dishes, or take an evening walk. Sometimes they last half an hour or more. Often, they last only a few minutes. Either way, they are mini connection points. They help us add one more strand to the glorious tapestry of our relationship with our children, and dive into a story one more time before we set it aside. They are organic because they happen in ordinary, unplanned moments of our day. When you consider the two different kinds of conversations, intentional and organic, keep in mind that one is not better than the other. They are both excellent tools to use to connect with your kids. Use whichever one fits your circumstances best. If you’re on your way to sports practice or casually bebopping around the house, try an organic conversation. If you’ve just finished reading aloud a book together and want to celebrate, strike up an intentional conversation, and make it an event. You will find that your children open up far more and will be more comfortable talking about books if you approach them with a casual and kind attitude. Because being easygoing and friendly isn’t necessarily our natural disposition when it comes to interacting with our kids (ahem), it’s helpful to keep a few things in mind as we go about this. I call them the 5 Keys of Conversation—and we want to keep these keys in the front of our minds as we set out to have amicable discussions with our kids about books. These keys will help turn down the pressure and remind you that good discussions are, above all else, about enjoying and getting to know your child better. Key #1: Don’t talk about every book. Sir Francis Bacon said, “Some books are to be tasted, others to be swallowed, and some few to be chewed and digested.” Allow your children to taste, swallow, and chew. You don’t need to discuss every book you read aloud or every book your child reads on his or her own. When you demand that every book be discussed, it takes the leisure right out of reading and causes books to lose that all-important pleasure connection. Trust that the book can speak directly to your child, even if you never intervene with a conversation or discussion. Key #2: There are no right answers. For real. Remember to be friendly and conversational. Especially if you are having an intentional conversation, you may need to be mindful not to take on a condescending tone. The last thing we should do when we’re making a connection with our kids is talk down to them. Relationships simply don’t flourish that way. Even if their answers are not as deep or as impressive as you hoped they would be, there is no need to be overly concerned. There is a journey to Truth, and each of us must make that journey for ourselves. Allow your kids to gradually uncover Truth in all the secret places it hides. This is a marathon, not a sprint. Even if the conversations you have with your kids are not earthshaking, remember that the most important part is demonstrating interest in what is happening in your child’s mind. We can’t quantify the power of a true connection, and connection is what we’re after. Any time your child gives you a one-word answer, follow up by asking, “Why?” It may take some time before your child trusts that you aren’t actually looking for a specific answer or that you aren’t quizzing her. Kids who are not used to being asked what they think just for the nature of good conversation—without intention on the part of the adult to shape, change, or grade the child’s answer—will probably be a little gun-shy of these questions at first. Press on. Keep asking open-ended questions; keep emphasizing that there isn’t a particular answer you’re looking for; keep conversing and communicating. Key #3: Compelling questions matter more than compelling answers. When you start asking your kids open-ended questions, you may be surprised at their answers. Remember this: The art of asking compelling questions is more important than getting compelling answers. A child who practices asking questions will start to ask them on his own, consciously or subconsciously, whether he articulates it or not. We want to strengthen the child’s habit of asking questions and thinking deeply. You can’t usually wrap up a juicy conversation with a tidy bow. The last thing you want to say is, “and so the lesson from this story is . . .” Let the story be as big and magnanimous as it will. Let it remain shrouded in a bit of mystery. Some of the best literary conversations I’ve had with my kids have been about books my children have read but I have not. I suspect that’s because my child knows that I am not looking for right answers — I don’t know the right answers! I just want to know what they think, and that opens up a beautiful opportunity for connection and communication. This is true outside of your reading life, as well. You can use these questions for sitcom episodes, movies, comic strips, songs, sports, activities, games — they are all stories, after all. They all have a character who wants something, has to overcome an obstacle, and either succeeds or fails. Try asking these questions about any story you encounter, written or otherwise, and see what conversations erupt. Key #4: Plant seeds and step aside. We adults like our truths to be contained in tidy lessons and simple frameworks. But Truth is neither simple nor tidy, and God himself revealed it to us in parables and stories that cause us to ask ourselves questions again and again, to come back over and over again to look, to fall in, to contemplate, and to wonder. You can’t usually wrap up a juicy conversation with a tidy bow. After all, the last thing you want to say is, “and so the lesson from this story is . . .” Let the story be as big and magnanimous as it will. Let it remain shrouded in a bit of mystery. Sally Lloyd Jones, author of The Jesus Storybook Bible, once told me that adults are more comfortable with programs and bullet points because when we use them, we’re in control. Stories make us uncomfortable because when we tell them, we aren’t in control. Plant your seeds by reading aloud with your kids. Water those seeds by having open-ended conversations about them. But don’t demand that the seed blossom before its time. Your job is to plant and water and nurture. Let the book work its magic on the soul of your child in whatever way God desires. What the seeds grow into—what they become and how they nourish the life of your child—that’s a mystery both to us and to them. That is up to the Master Gardener alone. Key #5: Use simple reading journals to deepen the conversation. The best questions will often send your child back to the book for the answer. As such, it can be helpful to encourage him to keep a commonplace book or reading journal. A commonplace book or reading journal is simply a place to mark down passages and quotes, to make a list of books you have read, want to read next, or books you loved most. Your child can also include thoughts he has, if he’s so inclined. This can be as simple as a spiral-bound notebook, or you can choose to go a bit fancier with nice journals from your local bookshop or paper store. A child who gets used to making note of language that moves him is a child who learns that language has power. In our home, when we begin to discuss a book, we often find ourselves flipping through our reading journals to find what resonated with us. They don’t need to be the most profound passages or most meaningful quotes. Your child doesn’t even need to know what the passages mean or why they are significant to him. Keep this simple, light, and pleasant, free from too many rules or restrictions. A personal collection of book passages that mean something to the individual is a treasure, not something to be graded or criticized. This is not the place to point out your child’s sloppy penmanship or poor spelling. It is, rather, one extension of the connection your child is making with the book. I require my children to log the books they’ve read in their reading journals, but I resist setting other requirements on the kids’ journals whenever possible. You alone can decide what is best for your own kids—just keep in mind that you want the reading journal to be a tool that helps you maintain that easygoing, friendly disposition we’re shooting for. Don’t succumb to the temptation to make it an assignment, or you may find that the journal doesn’t lend itself to reading joy but does the opposite. When it comes to the impact we can make in our children’s lives, we’ll be hard-pressed to find a more effective tool than discussion. My hope is that you will strike up both intentional and organic conversations with your kids, and approach them in a warm and pleasant manner by keeping these 5 Keys of Conversation in mind. You don’t have to talk about every book your child reads. There are no “right” answers to open-ended questions about books. It’s more important to ask compelling questions than to get compelling answers. Your job is simply to plant the seed, and if it works for your family, you can deepen the conversation by helping your child collect his own favorite passages from books in a simple reading journal. This will go a long way in connecting you to your child, but it’s only the beginning. Now we need to know which questions to ask to get juicy discussions going. 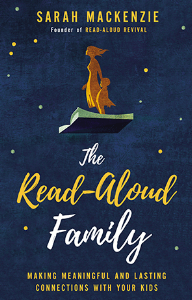 Taken from The Read-Aloud Family by Sarah Mackenzie. Copyright 2018 by Sarah Mackenzie. Used by permission of Zondervan (www.zondervan.com).